As a custom manufacturer, we can help you design cabinets suited to your exact needs. An ironing board cupboard, a folding surface with recessed task lighting, an under cupboard dryer sheet dispenser, a built-in clothes rack…the possibilties are endless. Here, custom storage cabinets are trimmed to match the skirting over the washer and dryer, the trash container is out of the way in a cupboard and the ironing board and clothing rack are tucked into a tall utility cabinet. 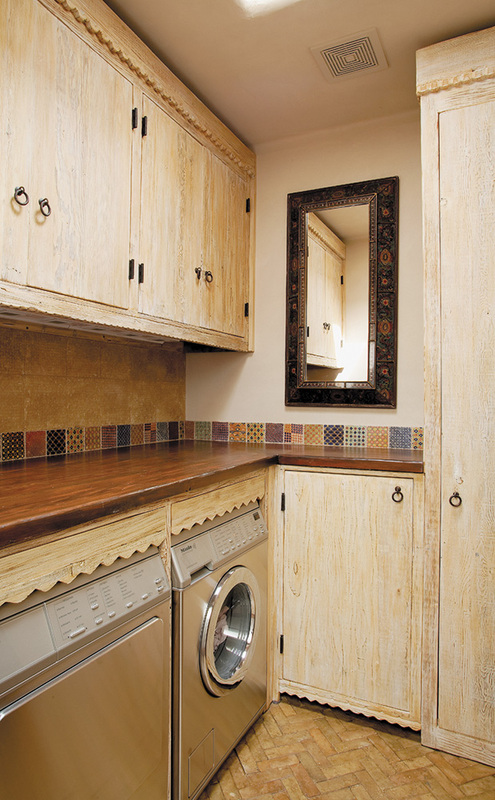 Constructed entirely of reclaimed Douglas fir, the cabinets are finished with a custom hand rubbed patina, making this laundry room bright and airy.